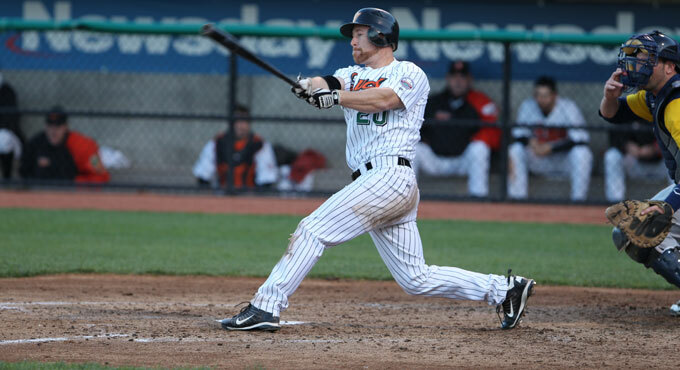 (Central Islip, N.Y., Aug. 27, 2013) – The Long Island Ducks today announced the signing of outfielder Lew Ford. The former Major Leaguer returns for his fourth season with the Ducks and in the Atlantic League. Ford began the 2012 season with the Ducks and was signed by the Baltimore Orioles organization after hitting .333 with four homers and 14 RBI in just 19 games. After batting .331 with 11 homers and 40 RBI with Triple-A Norfolk, he was called up by the Orioles on July 29, becoming the 13th player in Ducks history to return to the Major Leagues after playing on Long Island. The Texas native compiled three homers, four RBI and seven runs in 25 regular season games with Baltimore before going 3-for-8 with a run batted in and a run scored in the American League Division Series against the New York Yankees. In the Orioles organization this season, Ford combined to play 33 games across three different levels (RK, AA and AAA) and totaled five homers, 14 RBI, 13 doubles and 24 runs. He is a veteran of five seasons with the Minnesota Twins from 2003-2007 and owns a career .268 average with 35 home runs, 83 doubles, 10 triples, and 48 stolen bases in the big leagues. During his three seasons on Long Island, the 37-year-old has a .326 batting average, 24 homers, 114 RBI and 53 doubles in 184 games. Ford was originally drafted by the Boston Red Sox in the 1999 MLB Amateur Draft.